Have opinions about Blogger? If so, we'd like to meet you. We are looking for participants willing to document their blogging practices over a few weeks and answer some interview questions. This will help us better understand your needs and keep improving Blogger. Last October we launched a comments feature that let you embed comments and the commenting form below your blog posts. Today we have extended embedded comments to display profile images next to the comments that your visitors write. Though profile images have been available with the other commenting options, we are happy to bring them to embedded comments as part of the Blogger Birthday feature series. We've also made it much easier to upload a profile photo when you leave a comment on a Blogger blog. 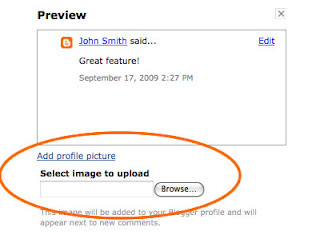 From the comment preview, click "Add photo" to upload a photo to your Blogger profile. The next time you comment on a Blogger blog, your profile photo will be displayed next to your comment. 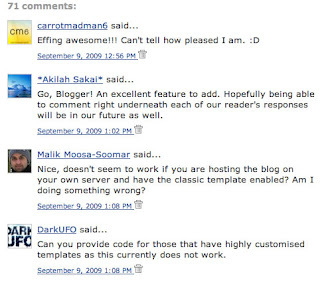 To enable or disable profile images in your blog's comments, go to Settings | Comments. To continue Blogger's 10th anniversary celebration, I’m delighted to announce that Blog2Print has now partnered with Blogger. 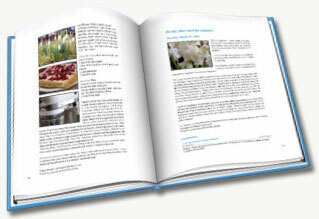 Blog2Print lets you publish some or all of your posts and photos as a professionally-printed, full-color book. Since 2007, thousands of Blogger users have become Blog2Print fans, using our easy and quick service to save and share all their favorite writings with friends and family or to keep a hard-copy version of their work. You can make books by season, by year, by event or even by theme, and you can choose from soft cover or hard cover versions of your book. Your book from Blog2Print.com can include selected comments from your posts, and you can also add your own additional photos and new comments as you edit your book to make a unique edition for posterity. Blog2Print is easy to use – just enter your blog URL, select the date range for the posts you’d like to include, and choose a cover from among the nine choices. You can add an optional dedication, and then click to produce your book. A table of contents will be generated automatically, and in a few seconds you’ll see a preview of exactly what your finished book will look like. Best of all, Blog2Print books start at only $14.95 for a soft cover book. The base price includes 20 pages, but you can add as many pages as you like – just 35 cents each. In honor of Blogger’s 10 birthday, all of us at Widgetbox are excited to announce a partnership with Blogger that allows you to quickly and easily turn your blog into a widget. Whether you want to add your blog’s headlines to your main website, let your fans showcase your content to their audience, or you want a widget that helps make your content more discoverable across the web, Widgetbox-powered widgets will help you get the most visibility for your content, while eliminating the need for any manual updating or management. How Do You Build Your Widget? Tens of thousands of Blogger users have already made a widget from their blog on Widgetbox. Take your blog feed, make it into a widget, and share it with everyone. It’s that easy! link. The Event Gadget is currently one of the featured gadgets, or you can add it directly by clicking "add your own" and entering the URL http://www.google.com/ig/modules/calendar/socialevent/bloggerevent.xml. You'll then be taken to a configuration page that lets you enter information about your event. Once you click Save, it will be visible on your blog for everyone to see. The gadget allows your readers to indicate whether they are going to attend the event, and lets them see which of their FriendConnect friends will be there too. In addition, anyone with a Google Calendar account can simply click a link to have that event added to their Google Calendar. You can add multiple events to your blog as long as you give each one a different title or ID, and we'll keep track of who's attending which one. Do you have an event you'd like to invite your readers to? Thanks to Blogger Gadgets, this is now a piece of cake. Click the Customize link in the toolbar, and go to the Layout tab. There, you'll see the Add a Gadget link. The Event Gadget is currently one of the featured gadgets, or you can add it directly by clicking "add your own" and entering the URL http://www.google.com/ig/modules/calendar/socialevent/bloggerevent.xml. You'll then be taken to a configuration page that lets you enter information about your event. Once you click Save, it will be visible on your blog for everyone to see. --- a process that was complicated and error prone. Today we are excited to announce our latest birthday present: Jump Breaks. With Jump Breaks you can show just a snippet of your post on your blog's index page. 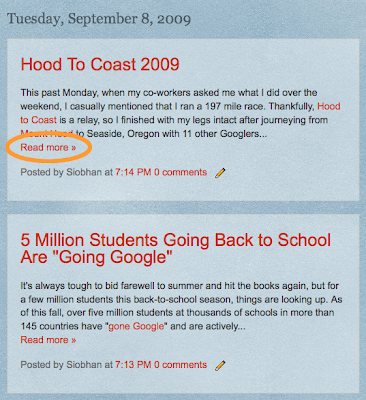 Blogger will insert a "Read more" link to the full post page where your readers can keep reading. There are a couple of ways to insert a "Read more" jump to your posts. If you use the new post editor (available on Blogger in Draft, or by enabling it via the Settings tab), you'll notice the "Insert jump break" icon in the editor's toolbar. Click this icon and the "jump break" will be inserted into your blog post at your cursor's position. If you don't use the new post editor, you can still insert a jump break in Edit HTML mode by adding <!-- more --> where you want to position the jump break. Want to change the "Read more" text to something more your style? No problem. You can edit the "Read more" text by clicking Layout and then Edit the Blog Posts widget. Update: Users that have customized their Blog Posts widget or otherwise have highly customized templates: You may need to edit your HTML to enable Jump Breaks. First, back up your template, then follow the instructions at the bottom of this help article. It's time to announce another Blogger Birthday feature! Many users have been asking for an easy way to implement "Read more" links on their blog's index page. In fact, for years bloggers have been implementing "Read more" jump breaks themselves by manually editing their HTML --- a process that was complicated and error prone.
! ), and we want to let you know that a Blogger extension is included in the Chrome Extensions gallery. The BlogThis! Chrome extension is available now, one of several hundred extensions to be found in the Chrome extensions gallery. Using the BlogThis! Chrome extension, you can start writing a blog post in one click. Whenever you are inspired by a web page you are looking at and want to blog about it, just click on the BlogThis! button on your Chrome toolbar, and the Blogger post editor opens up with a pre-populated link to the web page you were on. If you want to include any text in your post, simply highlight it before clicking on the BlogThis! button. Edit the post as you'd like, and publish it instantly or save it as a draft for future posting. To try out the BlogThis! Chrome extension, first switch to Google Chrome BETA (if you are not already on that version), and install the BlogThis! extension by clicking on "Extensions" on your browser toolbar or visiting the BlogThis! extension homepage. Note: Extensions are only available for Chrome on the PC and Linux; Extension support on Chrome for Mac is under development. More and more of you are using Google Chrome (more than 30 million active users now! ), and we want to let you know that a Blogger extension is included in the Chrome Extensions gallery. The BlogThis! Chrome extension is available now, one of several hundred extensions to be found in the Chrome extensions gallery. In honor of Blogger's 10th anniversary, we are excited to announce that you can now use your blogs to create positive, measurable social change. By adding the SocialVibe gadget to your blog, you'll be turning brand dollars into real charitable donations for the cause of your choice. The World Wildlife Foundation, Nature Conservancy, DonorsChoose, Invisible Children, and Charity:Water are just a few of the great charities you can support on Blogger. 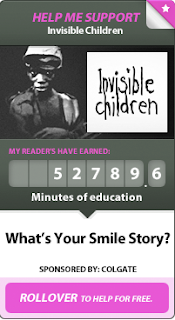 Once you install the SocialVibe sidebar gadget on your blog, money will be earned for charities every time readers engage with the gadget (e.g. rating a Showtime video clip). You can switch your cause and sponsor as often as you like, and receive regular updates from your charity about goal progress and impact. Thus far, SocialVibe has been able to raise over $500,000 for charities, and we know the Blogger community will be able to significantly increase this amount. In fact, we are setting a goal for the community to raise $50,000 before the end of the year (and remember, you don't raise money by taking money out of your pocket—or your audience's—but rather by getting your readers to engage with your SocialVibe gadget). Here's the fun part. Choose the cause you want to support from the drop-down list. If you want to customize the size and title, you can do that here as well, and you'll see a preview of your gadget underneath. When you're satisfied, click Save. Congratulations, your gadget has now been added to your blog! Your readers can help you earn for your cause by engaging with your gadget, and will even have the chance to leave you comments and add a SocialVibe gadget to their own blog. The yellow overlay you see on your gadget is only viewable by you, the blog owner. Click on the link in the overlay to create a SocialVibe.com account and earn even more charity donations by adding it to other networks such as Facebook, MySpace or WordPress. With SocialVibe, the Blogger community can pool our individual influences to create positive change in the world. Never before has making a positive social impact online been this easy.